Welcome to Afternoon to Remember On-Line! Need help planning a tea party? This book is for you! Need help planning a tea party? This book is for you! From the planning to the serving, 12 Teas to Remember explains step by step how to host a tea party your guests will remember and love. Check out my latest healthy gourmet recipe blog: Gourmet Done Skinny. Please visit our website for more information. We also have a Facebook page and group. Check out our scone video on You Tube on “How to Make Cranberry Orange Scones.” We have also finished our first e-book which is a collection of our delicious scones from all of our five cookbooks. There are 20 scone recipes in all. It’s $9.95 and can only be purchased on-line. You’ll be directed on how to download it immediately after ordering. 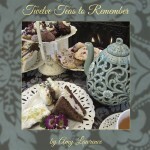 Check out our selection of Afternoon Tea Cookbooks! Shown here: Our 9th cookbook Entertaining with Amy. 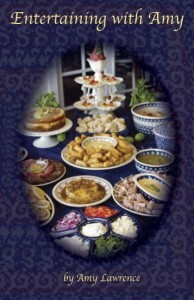 Order it and our other cookbooks today on-line. Be sure to get your copy today!